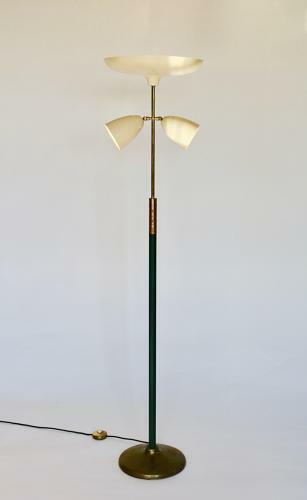 Italian floor lamp from the 1950`s. 3 lacquered metal shades, the 2 smaller side shades are adjustable in all directions. 3 lamp holders, one in each shade. The top shade measures 40 cm wide. Brass base and stem with the lower half of the stem wrapped in green leather.